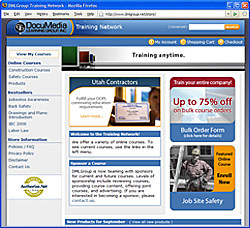 DocuMedia Learning Group’s Training Network hosting services and learning management system offer a secure access point for your custom training courses. Your employees, associates, vendors, or clients complete courses through the custom web-training system, which enables media-rich presentations, quizzes, exams, evaluations, and simulations. Whether you have a complete course or want us to develop one for you, we can help. Your learners will appreciate the easy learning environment and the ability to view and print electronic certificates of completion. You will appreciate the 24/7 access to training and resources. Host your completed course on the Training Network. If you have a completed web course, we’ll load your course into the learning management system. You choose the best fee model for your business: per use or monthly maintenance. Let us convert your course for the web. If you have a PowerPoint course or a paper-based course, we can convert your course for the web. Then, we can host your course on the learning management system, which provides secure access to all your content, reports, and learner progress information. We can develop and host your training. If you have an idea for a course, our team of instructional designers can develop a custom course that addresses your specific training needs. You will have full access to our technical and instructional teams throughout the development process (see also Content Development). And since we will also host and maintain the course, this becomes a truly hassle-free approach to meeting your training requirements. To keep you in control, we provide you with training reports and grant you administrative access to the learning management system. We will even train your company facilitators and HR personnel to use the learning management system to track learner metrics and statistics. Our support and maintenance services include facilitator training, custom reports, end-user technical support, content updates, and system and course upgrades.